It is a truth universally acknowledged, that the best discoveries you will make on road trips are those you don’t plan for at all. It was under that truth, that we stumbled upon The Olde Gener’l Store in Cave City. In the summer months — most likely after Memorial Day and before Labor Day — Cave City is thriving with restaurants, novelty shops, miniature golf courses and alpine slides (yeah, that one confused us, too). Only the biggest attractions stay open year round. Now that’s not to say you can’t find ways to have fun. Case in point: Our discovery of The Olde Gener’l Store. Just look how beautiful it is. So stuffed full of treasures, they are overflowing onto the store’s wrap-around porch. We stopped at the Gener’l Store because … well … we just couldn’t NOT stop. Signs declare it “the most unusual store in the Cave Country.” We declared it the most wonderful. We met Leroy, the owner, who told us the store had “antiques, collector items, gifts and crafts, and other old things and stuff.” It was a perfect description. 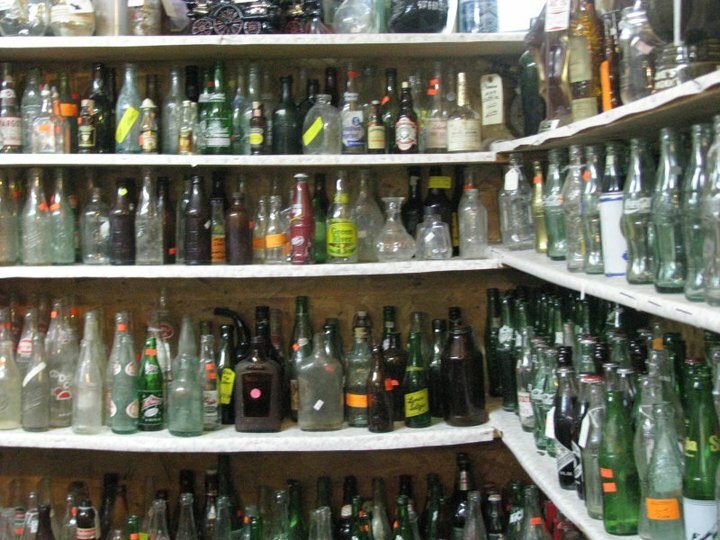 Leroy has been collecting the old things and stuff for more than 50 years. He declared himself one of the original American Pickers and had stories about finding old mirrors and bikes and wagon wheels tucked away in friends’ garages, or the time he bought 22,000 license plates from the Kentucky State Penitentiary in 1976 right before the prisoners stopped making them by hand. 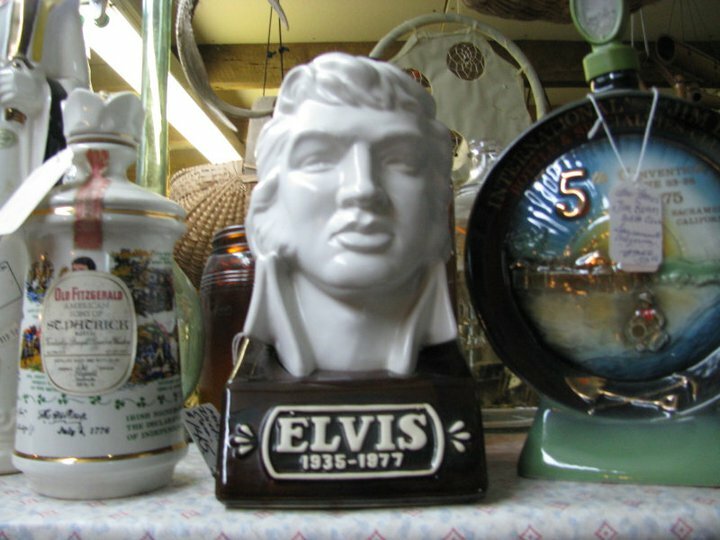 This Elvis bust? He spotted that an estate auction, “on down the road” years ago. So armed with our over-enthusiasm for Leroy’s hidden treasures, we started making our way around the store. We swooned over old mirrors and paintings, vintage trunks and furniture, chandeliers, old bottles, wooden crates and a fully-functional slot machine. Two hours and a combined $100 later, we were begrudgingly stowing away our new treasures — some moccasins and a set of cast iron jail keys among them — in the trunk of the car and saying goodbye to our hero Leroy. Sure, we were impressed by our new purchases. Yes, we could have spent another several hundred dollars if we had it. But mostly, we were just awed by a man’s collection and all of the years he spent — the adventures he had — finding this … stuff. 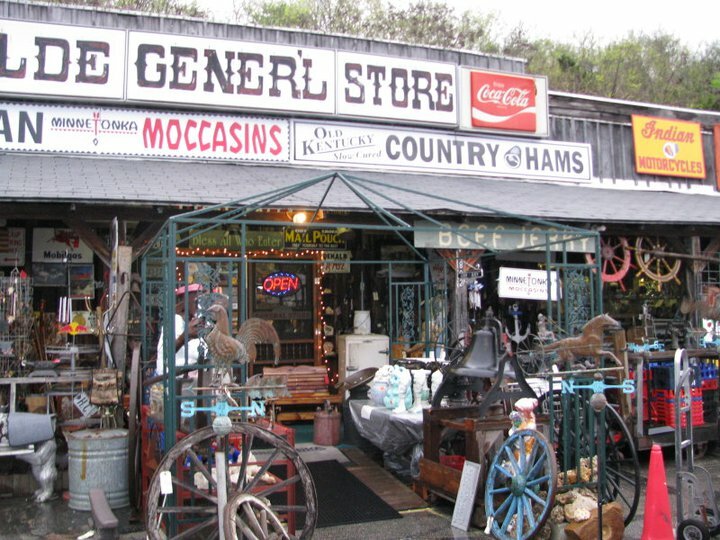 The Old Gener’l Store is located at 802 Mammoth Cave Road, Cave City, Ky. (Take Exit 53 from Interstate-65). It’s open every day 10 a.m. til close … Which means whenever the shop is empty and Leroy feels like going home. The store is closed on Sundays. For more information, give them a call at (270) 733-3300. Not a dime just to walk around and have a look. But we dare you to leave there without finding something you just have to have. Prices vary and they’re fair — Leroy’s an honest businessman. Looks like it is going to be a lot of fun.. and a lot like what I’m doing at http://www.kaintuckeean.com One day, we’ll share notes. And yes, I figured you all were a couple of guys…. We’ve had fun so far! We’re headed to Central Kentucky in the next few weeks … not sure exactly where yet, but we’re looking forward to it. Cameron and I have enjoyed looking at your blog — there are several great blogs shining light on cool things to do in Kentucky. It’s good to see.